"A voice that will never fade away"
A veteran playback singer, Prathivadi Bhayankara Sreenivas has been one of Kannada film industry's greatest musician who went on to become an unique and memorable voice in Tamil and other south Indian film scene. Born in Kakinada, Andhra Pradesh, he got his musical genes from his mother who was a musician. Sreenivas debuted in 1952 in Gemini Studio's Hindi movie Mr. Sampat. He sang alongside singing legends like Geeta Dutt and Shamshad Begum. His superhit song "Aji hum Bharat ki naari" with Geeta Dutt helped him get an entry into the South India film industry. He achieved tremendous success after his movie Bhakta Kanakadasa starring Dr.Rajkumar. The song Baagilanu Teredu went on to be superhit. He soon became the voice for many a hero, including Dr.Vishnuvardhan, Srinath, Kalyan Kumar and Udaya Kumar. But he was considered the voice of popular Kannada star Dr.Rajkumar for whom he had sung close to 300 super hit numbers. He has been credited for singing over 3000 songs in Kannada, Tamil, Hindi, Telugu, Malayalam, Tulu and Konkani films. He was not just a singer but also an ace poet who wrote beautiful poetry in several languages. Till late 90's anyone who visited the most famous Drive-in restaurant in Chennai could have frequently spotted this prolific singer sitting quietly writing poetry. His golden voice was most suited for the best of melodies created by the popular music directors over 3 decades. 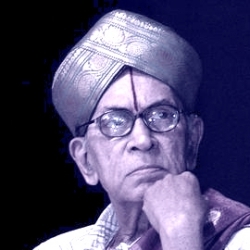 P.B Sreenivas has been honoured with the prestigious Kannada Rajyothsava award, Kalaimamani award and Karnataka Nadoja Award.